Problem skin? No problem! Banish common skin complaints with Biologi. It’s very rare that anyone will get through life without experiencing one or more periods of a recurring or ongoing skin problem. Teenage acne. Winter dry spots. Stress-induced blemishes. We’ve all been there, and we’ll all be there again. Skin is the bodies largest organ and, as the primary barrier between your body and the unforgiving environment, in its role as protector it puts up with some harsh conditions which can cause marks, blemishes, and flaws. In our quest for perfect skin, here are some common skin complaints that most of us will experience at some point or another, and how regular use of Biologi serum will cause them to fade away into nothing more than a distant memory. Dark circles appear under the eye area when the layer of skin thins and the blood vessels under the surface become more visible. A myriad of environmental factors can cause dark circles. Lack of sleep, dehydration, aging, allergies and irritation are the most common, but certainly not the only reasons. Some people simply have the genes that make them more prone to dark circles than others. In lieu of stopping the body clock, eliminating environmental factors, or spending a fortune on makeup, there is a practical solution. To eliminate dark circles, increase the volume of the under-eye area to act as padding between the blood vessels and the surface of the skin. To do this, you’ll need to stimulate collagen and elastin to firm up the eye area, and this is where Bk serum is about to become your best friend. This serum has the highest level of natural Vitamin C contained in any product on the market. Vitamin C stimulates collagen production and strengthens skin cells making them appear plumper to keep the blood vessels well-hidden. Don’t believe us? Take a photo before you start using Bk serum. Gently apply half a pump of Bk every night on the delicate under eye area and take weekly progress shots. You’ll notice your dark circles visibly fading in no time. The traditional cure for dry skin is to moisturise. And the more dehydrated your skin gets, the more intensive the recommended product. Unfortunately, intensive products are filled with harsh and abrasive ingredients (even ones labelled ‘natural’ or ‘suitable for sensitive skin’) so the very lotions that are meant to cure dry skin, often end up causing more irritation. As skin becomes even drier and potentially cracked, the skin is exposed, and you lose even more moisture making the problem worse. Repairing dry skin is a two-pronged approach. Firstly, exfoliate dead skin cells which give the appearance of dry skin when left to sit on your body. Next, penetrate the deeper layers of the skin with a hydrating serum that gets to work on hydrating skin cells long before they reach the surface. The fruit acids in Bf serum offer an enzyme exfoliation. It’s a soft and gentle serum and is water-based which allows for better penetration and hydration. The Bf hydrating serum is suitable for use all over the body (even on the face) and because it doesn’t contain synthetic ingredients, you can be confident it won’t irritate your sensitive skin and, most importantly…it works! If you have an oily t-zone, you might be hesitant to keep applying harsh products. Your skin is producing enough oil on its own, so more products will only add to the blocked pores. The critical thing to remember about oily skin is that you need to encourage a regular oil flow rather than stop or block production altogether. Blockages cause breakouts, so you don’t want oil flow to become stagnant. Ordinarily problematic skin types (for example, an oily-t-zone) respond well to low PH products like the fruit acids found in Biologi serums. The enzyme exfoliation performed by tartaric acid (prominent in Davison Plum – the active ingredient in Bd serum), helps to break down the protein bond that’s stopping your dead skin cells from dropping away. Your skin then cleanses and clears away those blackheads and controls the oil flow. 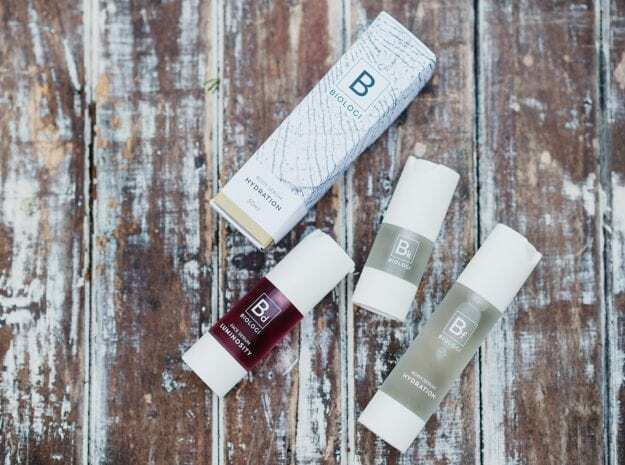 When you use Bd, you’ll find you have the perfect balance of oil flow and hydration to remove the appearance of an oily t-zone. Pigmentation (light brown spots on your face and body) is caused by angry and inflamed skin which can be due to sun over exposure or hormones. To reduce pigmentation, you must first calm the skin down. Bd serum contains gallic acid and quercetin which both boast a high anti-inflammatory property, plus it’s our highest antioxidant product. Daily use will reduce existing pigmentation, and the antioxidants will prevent any new pigmentation from forming. The Biologi serum range contains no synthetic ingredients, no irritating preservatives, and no harsh chemicals. Our serums are made from one natural ingredient and are effective in treating a variety of skincare conditions. Whatever the skin question, Biologi will always be our answer.